On which we try to provide the best and most current information for those concerned with arthritis of the shoulder and rotator cuff pathologies. If you have questions regarding the ream and run procedure feel free to email Frederick A. Matsen III M.D. at matsen@uw.edu. The rotator cuff is the most commonly torn structure in the shoulder. Rotator cuff tears usually produce symptoms of weakness and pain especially on trying to lift the arm. When an acute injury results in a rotator cuff tear consideration should be given to a surgical repair within six weeks of the injury to avoid atrophy of the muscle and tendon. Long standing rotator cuff tears and those that come on without an injury may benefit from a course of rehabilitative exercises (see ‘home exercises for the stiff shoulder’ and ‘home exercises for the weak shoulder’ on our website www.orthop.washington.edu). If these exercises are not helpful consideration can be given to a rotator cuff surgery – either to smooth out the roughness from the tear or if the tissue is of good quality and quantity to perform a surgical repair. 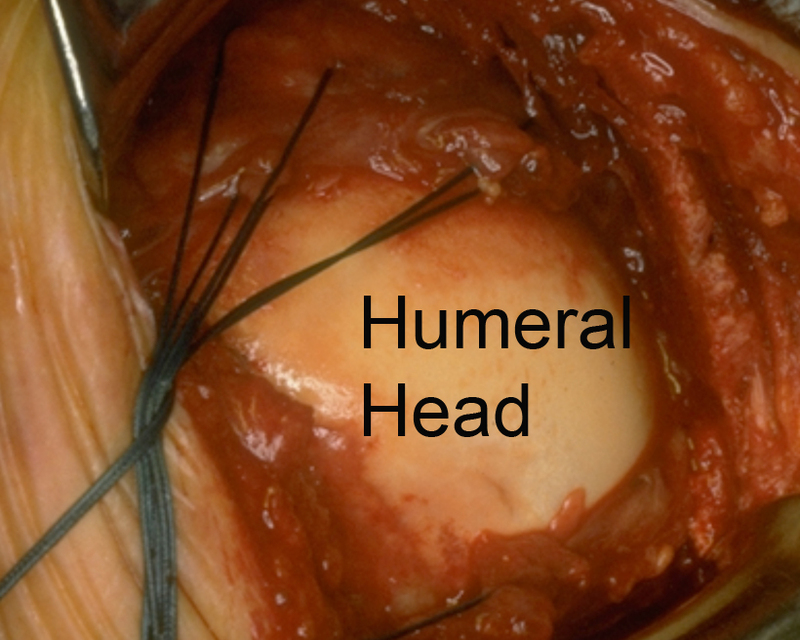 The ball (humeral head) fits in the socket (glenoid) and is held there by the rotator cuff. 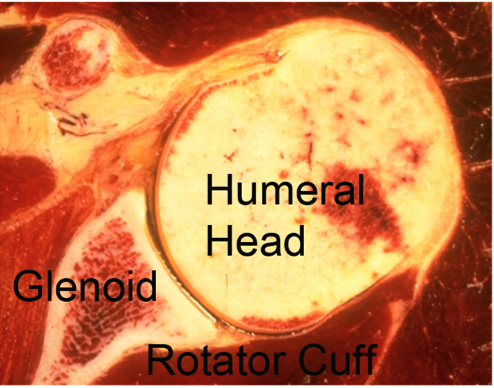 How Does The Rotator Cuff Attach To The Humeral Head? 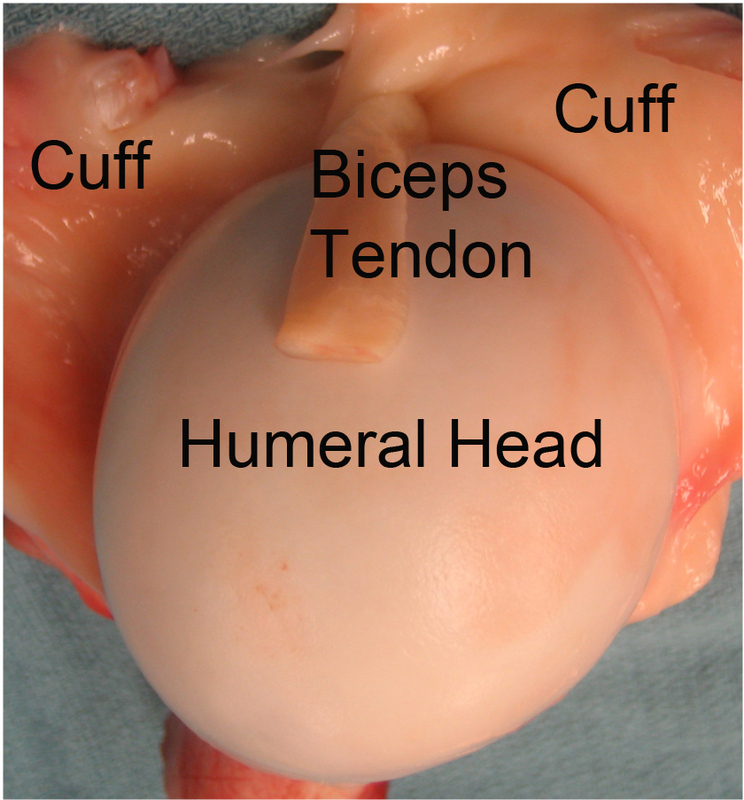 The rotator cuff attaches almost all the way around the ball of the shoulder (humeral head). The biceps tendon runs through the top of shoulder dividing the rotator cuff into a front half and back half. What Is A Rotator Cuff Tear And How Does It Happen? In a rotator cuff tear the edge of the rotator cuff tendons is pulled away from their normal attachment to the humeral head. This can result from a sudden force on the shoulder such as a fall on the arm or from progressive wear. In acute rotator cuff tears there is a history of an injury followed by shoulder weakness. In chronic cuff tears the history is usually one of progressive weakness over time. 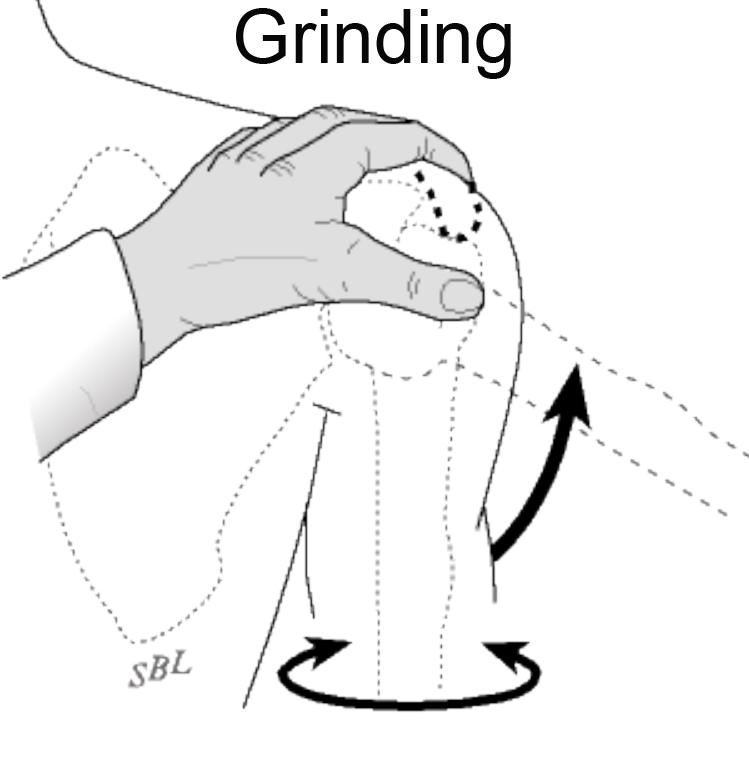 Examination of the shoulder may show grinding on motion of the shoulder and weakness on testing of the specific rotator cuff muscles such as those that lift the arm. How Can The Doctor 'See' A Rotator Cuff Tear? 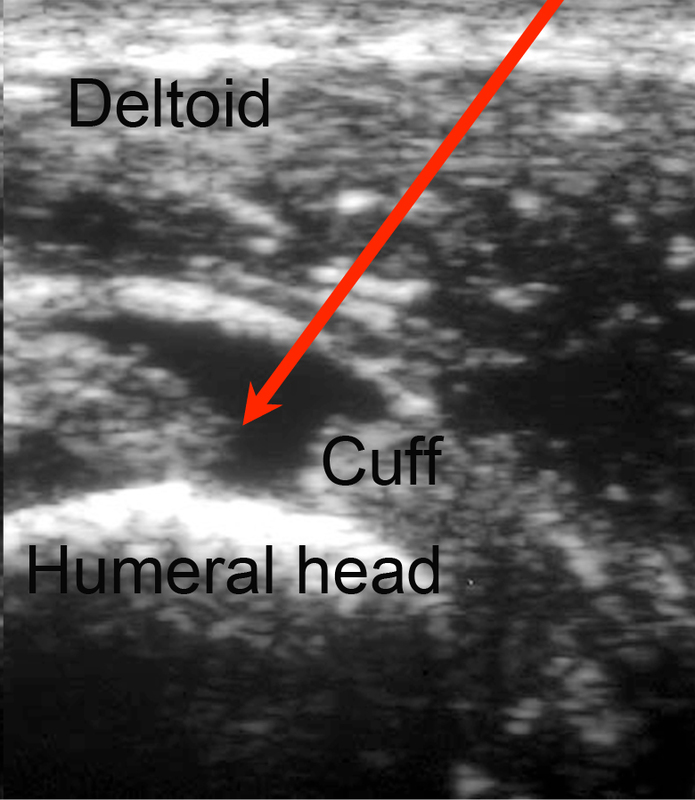 Using shoulder ultrasound or MIR a gap in the rotator cuff tear can be seen (arrows) and the quality of the remaining rotator cuff tendons can be evaluated. When Is It Likely That A Cuff Tear Can Be Repaired? In patients who are healthy and non-smokers a durable rotator cuff repair can often be achieved as long as there is a sufficient amount of good quality tendon for the repair. 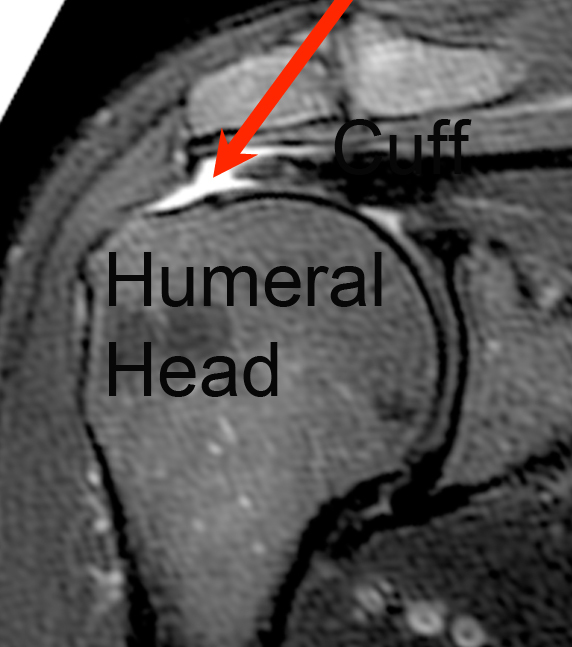 With time after a tear the tissue weakens and retracts leaving the humeral head exposed and making a durable cuff repair less likely. The rotator cuff tendon is mobilized from any scar tissue around it and brought out to its normal attachment to the humerus at the margin of the humeral head. A groove is made at this site and sutures placed so that they bring the tendon edge into the groove. How Does This Look At Surgery? 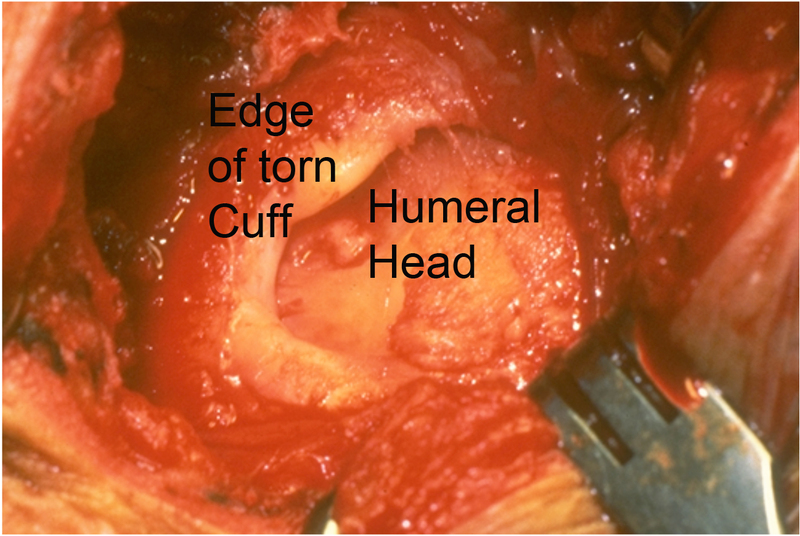 In this surgical photo one can see how the cuff has been brought securely to a groove in the humerus leaving the upper surface of the repair smooth. What If The Tissue Does Not Permit A Solid Rotator Cuff Repair? If good quality tissue is not available the repair is unlikely to hold up with use and time. In these situations it is often helpful to perform a ‘smooth and move’ surgery. In this procedure all scar tissue and rough edges of tendon and bone are removed from the shoulder and a gentle manipulation is carried out so that a full range of passive motion is achieved. After this surgery the shoulder can be moved immediately in that there is no need for protection. Patients can return to active use quickly; the exercises are directed at maintaining range of motion and building strength in the muscles and tendons that remain intact. Who Should Consider A Rotator Cuff Surgery? Surgery should be strongly considered in the situation when sudden weakness follows a shoulder injury and when an examination and ultrasound or MRI shows a rotator cuff tear with reasonable remaining tissue for a repair. In shoulders with the gradual onset of shoulder weakness and without a significant injury surgery can be considered if a stretching and strengthening exercise program does not yield the desired improvement. Preoperative ultrasound or MRI along with a careful examination can suggest whether a repair is likely to be possible or if a smooth and move is likely to be the procedure of choice. Who Should Probably Not Consider A Rotator Cuff Repair? A cuff repair is less likely to be successful in individuals with arthritis severe shoulder stiffness depression obesity diabetes Parkinson’s disease multiple previous shoulder surgeries and severely altered shoulder anatomy. Patients who use narcotic medication or who use tobacco are generally not candidates for this procedure. What Are The Keys To Success Of A Rotator Cuff Repair? Success requires good quality tissue a healthy patient technical excellence of the surgery and a steadfast commitment by the patient to the rehabilitation program prescribed by the surgeon. How Does A Patient Prepare For A Rotator Cuff Surgery? As for all elective surgical procedures the patient should be in the best possible physical and mental health at the time of the procedure. Any heart lung kidney bladder tooth or gum problems should be managed before surgery. Any infection may be a reason to delay the operation. Any skin problem (acne scratches rashes blisters burns etc) on the shoulder or arm should be resolved before surgery. The shoulder surgeon needs to be aware of all health issues including allergies as well as the non-prescription and prescription medications being taken. For instance aspirin and anti-inflammatory medication may affect the way the blood clots. Some of these may need to be modified or stopped around the time of surgery. Rotator cuff surgery is a surgical procedure that may result in pain immediately after surgery – this is especially the case of the repair of a major cuff tear much less with a smooth and move procedure. Pain from this surgery is managed by the anesthetic and by pain medications. Immediately after surgery strong medications (such as morphine or Demerol) are often given by injection. Within a day or so oral pain medications (such as hydrocodone or Tylenol with codeine) are usually sufficient. The patient is encouraged to be up and out of bed soon after surgery and to progressively reduce their use of pain medications. Hospital discharge usually takes place on the second or third day after surgery. 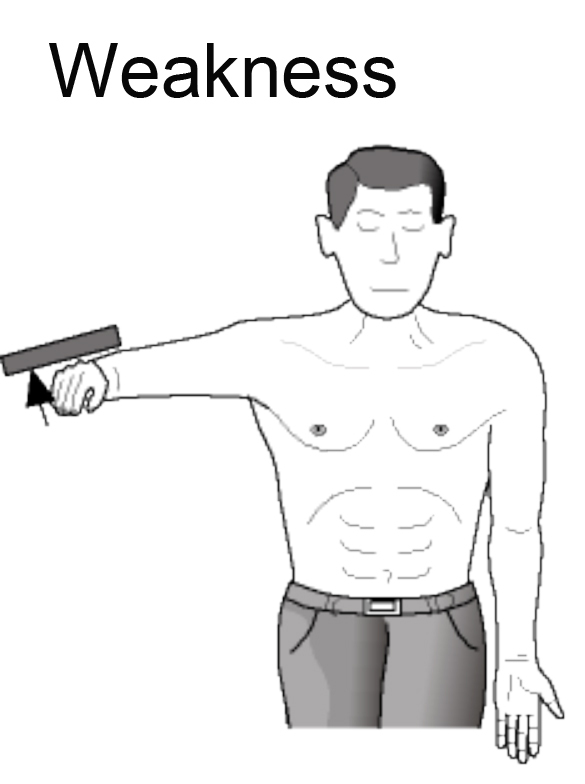 After a rotator cuff repair patients must not raise their arm actively (that is without assistance) for weeks or months following the procedure as specified by the surgeon. During this healing time the arm is protected in a sling. Patients are to avoid lifting more than one pound pushing and pulling for six weeks after surgery. Driving is not recommended for the first six weeks after surgery. Thus the patient needs to be prepared to have less arm function for the first month or so after surgery than immediately before surgery. For this reason patients usually require some assistance with self-care activities of daily living shopping and driving for approximately six weeks after surgery. Management of these limitations requires advance planning to accomplish the activities of daily living during the period of recovery. After a smooth and move procedure active use of the shoulder is initiated immediately after surgery in that there is no concern about overstressing a repair. In general patients are able to perform gentle ‘hand to mouth’ activities using the operated arm from two to six weeks after a rotator cuff repair. The rate of progression from that point is determined by the surgeon in light of the quality of tissue found at the time of surgery. Once A Shoulder With Rotator Cuff Surgery Has Successfully Completed The Rehabilitation Program What Activities Are Permissible? Once the shoulder has a nearly full range of motion strength and comfort the patient may progressively resume activities. It is important to recall however that even with a solid and complete repair and with good healing the tendon will remain susceptible to re-injury for up to a year after surgery. What Problems Can Complicate A Cuff Surgery And How Can They Be Avoided? Like all surgeries rotator cuff surgery can be complicated by infection nerve or blood vessel injury fracture instability and anesthetic complications. Furthermore this is a technically exacting procedure and requires an experienced surgeon to optimize the bony prosthetic and soft tissue anatomy at the procedure. The most common causes of failure are (1) failure of a rotator cuff repair to heal or (2) scar tissue that limits the range of motion after the procedure. What If A Rotator Cuff Repair Does Not Yield The Desired Result? If the shoulder remains stiff and painful despite the patient’s best efforts consideration can be given to a surgical release of scar tissue or possible a revision repair if sufficient quality and quantity of tissue remain. If this is not the case a smooth and move procedure may help restore comfort and function. How Many Rotator Cuff Surgeries Are Done At The University Of Washington? We currently perform approximately 60 of these procedures each year on carefully selected patients from across the United States. What If The Patient Lives A Long Way Away From Seattle? Because this procedure is not performed in many centers across the United States patients often come to Seattle from a long distance for the procedure. We are available by appointment in the Shoulder and Elbow Clinic 4245 Roosevelt Way N.E. Seattle on Mondays and Fridays to evaluate individuals with shoulder arthritis to discuss the procedures that might be most ideally suited for them. We perform surgery on Tuesdays and Wednesdays at the University of Washington Medical Center 1959 NE Pacific St Seattle Washington. Patients having rotator cuff surgery are usually able to return home three days after the procedure assuming they have mastered their exercises. The sutures used to close the skin can be removed by a nurse or physician near the patient’s home. Ideally we like to see patients back at six weeks after surgery to assure that satisfactory progress is being made. We request that patients complete questionnaires at 3, 6, 12, 18 and 24 months after surgery so we can track their progress and that the patient obtain and send to us X-rays at 12 and 24 months after surgery if they are unable to return to Seattle for the annual follow-ups. All patients have our personal email and the clinic contact phone numbers to use in contacting us at any time questions arise. Urgent rotator cuff repair should be considered when acute weakness occurs after a shoulder injury provided that shoulder ultrasound or MRI document a repairable cuff tear. Rotator cuff surgery (repair or smooth and move) should be considered in chronic rotator cuff tears that have not responded to a trial of exercise has failed to yield the desired result. In the hands of an experienced surgeon rotator cuff surgery can be an effective method for treating shoulders with rotator cuff tears. Pre-planning and persistent rehabilitation efforts will help assure the best possible result for the patient. 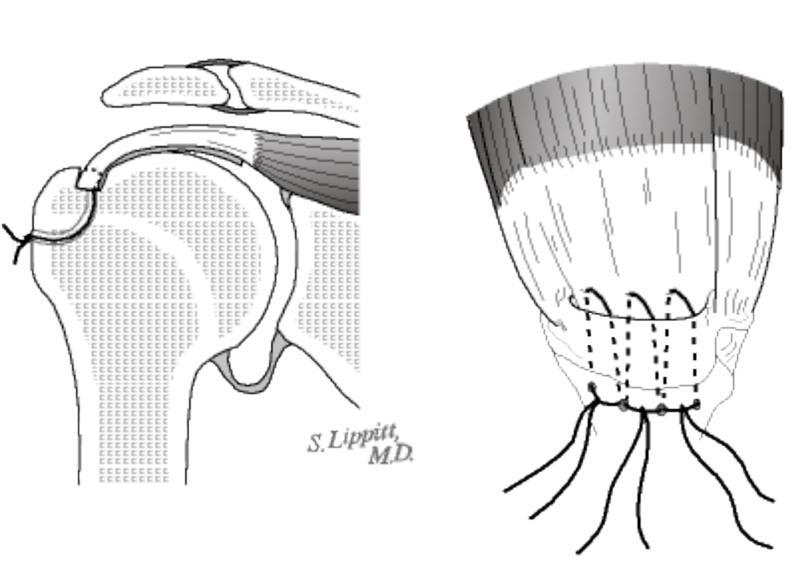 Howe C.; Huber P.; Wolf F. M.; and Matsen F. 3rd: Differential suture loading in an experimental rotator cuff repair. Am J Sports Med 37(2): 324-9 2009. Fehringer E. V.; Sun J.; VanOeveren L. S.; Keller B. K.; and Matsen F. A. 3rd: Full-thickness rotator cuff tear prevalence and correlation with function and co-morbidities in patients sixty-five years and older. J Shoulder Elbow Surg 17(6): 881-5 2008. Matsen F. A. 3rd: Clinical practice. Rotator-cuff failure. N Engl J Med 358(20): 2138-47 2008. Largacha M.; Parsons I. M. t.; Campbell B.; Titelman R. M.; Smith K. L.; and Matsen F. 3rd: Deficits in shoulder function and general health associated with sixteen common shoulder diagnoses: a study of 2674 patients. J Shoulder Elbow Surg 15(1): 30-9 2006. McCallister W. V.; Parsons I. M.; Titelman R. M.; and Matsen F. A. 3rd: Open rotator cuff repair without acromioplasty. J Bone Joint Surg Am 87(6): 1278-83 2005. Churchill R. S.; Fehringer E. V.; Dubinsky T. J.; and Matsen F. A. 3rd: Rotator cuff ultrasonography: diagnostic capabilities. J Am Acad Orthop Surg 12(1): 6-11 2004. Harryman D. T. 2nd; Hettrich C. M.; Smith K. L.; Campbell B.; Sidles J. A.; and Matsen F. A. 3rd: A prospective multipractice investigation of patients with full-thickness rotator cuff tears: the importance of comorbidities practice and other covariables on self-assessed shoulder function and health status. J Bone Joint Surg Am 85-A(4): 690-6 2003. Goldberg B. A.; Lippitt S. B.; and Matsen F. A. 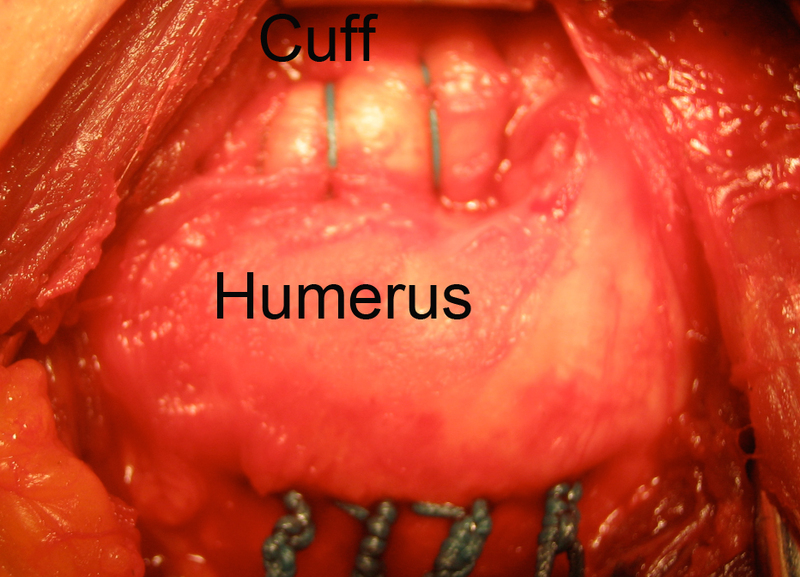 3rd: Improvement in comfort and function after cuff repair without acromioplasty. Clin Orthop Relat Res (390): 142-50 2001. Goldberg B. A.; Nowinski R. J.; and Matsen F. A. 3rd: Outcome of nonoperative management of full-thickness rotator cuff tears. Clin Orthop Relat Res (382): 99-107 2001. Smith K. L.; Harryman D. T. 2nd; Antoniou J.; Campbell B.; Sidles J. A.; and Matsen F. A. 3rd: A prospective multipractice study of shoulder function and health status in patients with documented rotator cuff tears. J Shoulder Elbow Surg 9(5): 395-402 2000. Norquist B. M.; Goldberg B. A.; and Matsen F. A. 3rd: Challenges in evaluating patients lost to follow-up in clinical studies of rotator cuff tears. J Bone Joint Surg Am 82(6): 838-42 2000. Duckworth D. G.; Smith K. L.; Campbell B.; and Matsen F. A. 3rd: Self-assessment questionnaires document substantial variability in the clinical expression of rotator cuff tears. J Shoulder Elbow Surg 8(4): 330-3 1999. Hollister M. S.; Mack L. A.; Patten R. M.; Winter T. C. 3rd; Matsen F. A. 3rd; and Veith R. R.: Association of sonographically detected subacromial/subdeltoid bursal effusion and intraarticular fluid with rotator cuff tear. AJR Am J Roentgenol 165(3): 605-8 1995. Mack L. A. and Matsen F. A. 3rd: Rotator cuff. Clin Diagn Ultrasound 30: 113-33 1995. Arntz C. T.; Jackins S.; and Matsen F. A. 3rd: Prosthetic replacement of the shoulder for the treatment of defects in the rotator cuff and the surface of the glenohumeral joint. J Bone Joint Surg Am 75(4): 485-91 1993. Arntz C. T.; Matsen F. A. 3rd; and Jackins S.: Surgical management of complex irreparable rotator cuff deficiency. J Arthroplasty 6(4): 363-70 1991. Harryman D. T. 2nd; Mack L. A.; Wang K. Y.; Jackins S. E.; Richardson M. L.; and Matsen F. A. 3rd: Repairs of the rotator cuff. Correlation of functional results with integrity of the cuff. J Bone Joint Surg Am 73(7): 982-9 1991. Clark J.; Sidles J. 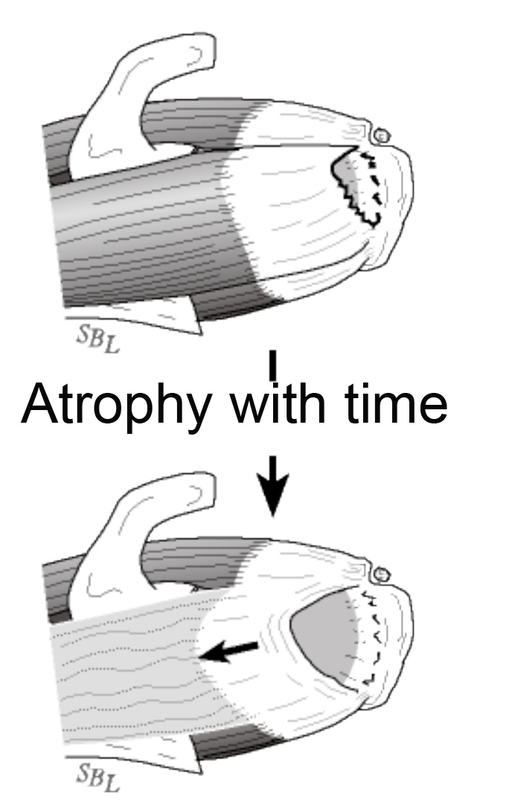 A.; and Matsen F. A.: The relationship of the glenohumeral joint capsule to the rotator cuff. Clin Orthop Relat Res (254): 29-34 1990. Mack L. A.; Gannon M. K.; Kilcoyne R. F.; and Matsen R. A. 3rd: Sonographic evaluation of the rotator cuff. Accuracy in patients without prior surgery. Clin Orthop Relat Res (234): 21-7 1988. Mack L. A.; Nyberg D. A.; Matsen F. R. 3rd; Kilcoyne R. F.; and Harvey D.: Sonography of the postoperative shoulder. AJR Am J Roentgenol 150(5): 1089-93 1988. Mack L. A.; Nyberg D. A.; and Matsen F. A. 3rd: Sonographic evaluation of the rotator cuff. Radiol Clin North Am 26(1): 161-77 1988. Mack L. A.; Matsen F. A. 3rd; Kilcoyne R. F.; Davies P. K.; and Sickler M. E.: US evaluation of the rotator cuff. Radiology 157(1): 205-9 1985. Kilcoyne R. F. and Matsen F. A. 3rd: Rotator cuff tear measurement by arthropneumotomography. AJR Am J Roentgenol 140(2): 315-8 1983.